Plant: Chinese wisteria (Wisteria sinensis) and Japanese wisteria (W. floribunda) are difficult to distinguish due to hybridization. They are often cultured as shrubs. Identification: Deciduous, climbing, twining, or trailing leguminous woody vine can grow up to 70 ft long. Branching infrequently, dark gray with light dots (Chinese) to white (Japanese) vines can grow to 10 inches in diameter. Leaves, alternate and pinnately-compound are 4 to 16 inches long with 7 to 19 leaflets. Oval to elliptic leaflets, 1.6 to 3 inches long and 1 to 1.4 inches wide, have tapering pointed tips. At different stages, hair exists on the leaflets. Fragrant, dangling clusters of flowers appear when the leaves emerge, generally from March to May. The pea-like flowers, 4 to 20 inches long and 3 to 3.5 inches wide, are lavender to violet and sometimes pink to white. Flattened legume pods, 2.5 to 6 inches long and 0.8 to 1.2 inches wide, appear from July to November. Greenish-brown to golden pods with velvety hair contain 1 to 8 brown seeds. The Asian wisteria vines resemble American wisteria (Wisteria frutescens). 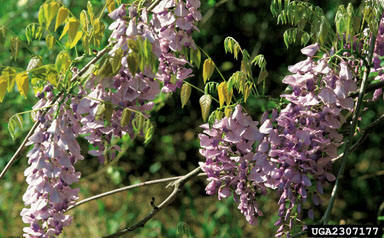 Ecology: The Asian wisteria vines form dense infestations where previously planted. They occur on wet to dry sites and colonize by twining vines and runners rooting at nodes. They spread along riparian areas by water-dispersed seeds. Herbicide Control: Apply from July to October a 10.2% active ingredient of picloram (Tordon 101 or Grazon P+D) as a 3 % solution (12 oz per 3-gal. mix), or a 24+% active ingredient of picloram (Tordon K) as a 2% solution (8 oz per 3-gal. mix), or a 60+% active ingredient of triclopyr (Garlon 4, Remedy, or Tahoe 4E) as a 4% solution (1 pint per 3-gal. mix) in water with a surfactant (methylated seed oil, basal oil, or crop oil) as a 1% solution (4 oz per 3-gallon mix) to thoroughly wet foliage. Alternatively, apply 40.9% active ingredient of clopyralid (Transline or Clean Slate) as a 0.5% solution (2 oz per 3-gal. mix) or a 41% active ingredient of glyphosate (Accord, Razor, or Roundup Original) as a 4% solution (1 pint per 3-gal. mix) in water with a surfactant at a 1% solution to thoroughly wet foliage and stems. Spray foliage of climbing vines as high as possible. During successive years, repeat application. Repeated applications are done from September to October. Use herbicide products like Arsenal AC, Garlon 3A, or Accord to make stem injections to large vines. Use herbicide products like Garlon 4 or Pathfinder II for basal spray application to large vines. Warning: The active ingredients of picloram, imazapyr, and clopyralid can kill or damage plants with roots in the treated area. Always read and follow label directions carefully. Herbicides with the active ingredient picloram are “Restricted Use Pesticides”.